Smart Samsung product again launched. Decided to embrace Symbian S60 3rd Edition, a product that appears similar to the Nokia product: Design of the trinkets that will remind us in one of the series N. although there remains a material selection priority samsung. If the G810 is not only made the slides, you will probably think this phone is the Nokia N70, especially when you see the cover right back on the camera cover. Some people familiar with the Samsung Ultra series of thin akan difficulties may receive, but for some who want to be seen without the effect of Macho lux and certainly love it. Effect of luxury achieve through the appropriate selection of material. Samsung retaining tradition and include a metallic design, both visually and immediately felt at the touch. Mobile surface decorated with plastic fiber smooth the withdrawal and the addition of a metal layer of metal in some of the original. The slider is usually we will find the button call / end accompany two Softkey. Not so with the G810, the phone instead insert two mysterious key. Two buttons are not labeled, so that to know the function we must first pressing. Button functions as the left button while the menu button to the right is a shortcut button that can be personalized. 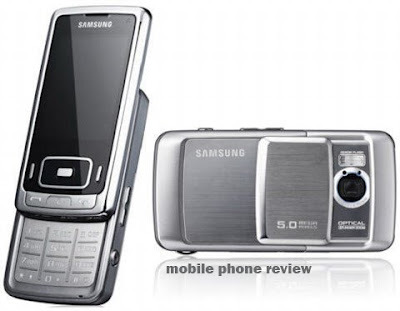 Performance Samsung G810 uses the Symbian operating system S60 3rd Edition FP1. Acceleration is quite good, but it is relatively outdated when compared with mobile phone-Nokia phone that has the latest supported FP2. One of the sets S60 3rd Edition FP1 and 2 is the ability to display the number from two sources at once. FP2 able to display a list of names from the SIM card and mobile phone simultaneously. With the OS like this, the G810 should be maximum. Call numbers 16.7 million colors! But G810 only use 262,144 color TFT screen with QVGA resolution and 2.6 inch diagonal screen. Compared with the N95, the G810 a bit smaller. G810 does not bring the highest resolution camera phone for now. The maximum resolution of the lens is only 2560 x 1920 pixels (5 mega pixel). However, concerning the quality and performance can still be equated with a 5 mega pixel camera phone answer at this time. On the software side we will have some functions present in the normal Samsung latest mobile phone camera. Options ISO, WB, 3x optical zoom, face detection, WDR Optimizer, Geotag already can be used maximally. Although there is little shortage in the picture, the results did not disappoint. For the video recorder appear reasonably good. Even though the speed does not reach 30 fps, VGA resolution video could have been taken with the 22 fps frame rate. Multimedia In addition to the camera, G810 superior ability to execute the file in the form of multimedia music and video. Performance is the same as the mobile-phone S60 3rd edition other. Types of files that can be executed is not much different. G810 also has provided Real Player and Flash player to execute the rmv video files, flv and mpeg. Features office & Internet Without the need to forget the fun of multimedia features that are provided, the G810 also features keep the office such as Quick office and PDF. There are also connections fast 3G HSDPA network, the activities to each document file via email can also be done quickly. G810 has been providing facilities to do the browsing to get information up to date via the internet. Available bandwidth up to 3.6 Mbps and WIFI network will facilitate this activity. This phone also comes with internal GPS receiver. Thus, you can use it as a tool determines the location based on the location of astronomy. Unfortunately, there is no navigation application that is provided in the phone. You must purchase and install yourself. As a means of connection, G810 bring micro USB data cable and Bluetooth. Both have supported the new software. This is especially useful because the connection is complete profile that can be selected. Standard battery of this type of phone used Lithium Ion battery with 1200 mAh capacity. Seems to be quite large, but when you see a prodigal energy features in the G810, it is not excessive if we call this "enough" to meet the needs. See complete feature that is provided, G810 is able to be an alternative in-between phone N95 mobile phone into one of the important points the phone. The balance of office and multimedia features into vendible next. However, the lack of support for licensing, especially in the navigation and the OS that is less up to date a stumbling block.